Customer of mine was running vSphere with Enterprise licenses and wanted to extend his environment with vCloud Director. Since the minimal requirement for vCloud Director 5.1 is a vSphere Enteprise license, we did some checking on what features would be left out when using just an Enterprise license instead of Enterprise Plus. The environment is quite small, it will be used to deploy Develop-Test-Acceptance environments with certain application sets. It is sized to handle 50 VMs and we estimated a maximum of 20 different networks and the environment will be hosted on 3 ESXi hosts. For the vCloud deployment only the distributed vSwitch, Storage DRS and Profile-drive-storage features apply. Since it is just a small environment with a few VLANs, the distributed vSwitch isn’t really needed. A good PowerShell script will quickly create a set of VLANs. The next feature is Storage DRS, but with just a few datastores there is no real benefit for Storage DRS. And the same goes for the Profile-driven-storage, the number of data stores is just too low to really differentiate on performance. In our case we have one Gold datastore and three Bronze datastores for vCloud. I would have expected that the Enterprise license would be enough and technically it is, but it turns out that for vCloud Director 5.1 the absense of Profile-driven-storage has quite an impact. 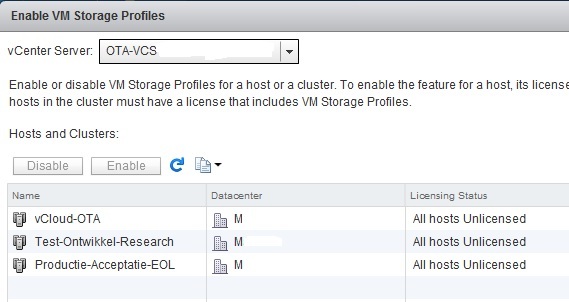 vCloud 5.1 no longer allows you to add single datastores to a provider VDC, you can only choose for the “*(any)” datastoreset or one or more storage profiles. And as stated before, the Storage profile is not part of the enterprise license. Because of this you can also no longer separate datastores between Provider VDC’s, since all the datastores the ESXi hosts see will be part of each Provider VDC. In our small environment where all hosts of the vCloud cluster can also see the datastores from the production cluster, we had to make the change to unpresent those LUNs from the ESXi hosts to prevent vCloud from using those datastores. Another method to keep vCloud from using the production datastores is to disable datastores in the “Manage & Monitor” view – “Datastores & Datastore Clusters”. 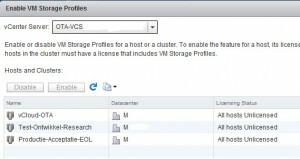 Just right click the datastore that should not be used by vCloud and disable it. This however does present a new minor issue, you will constantly have system warnings about disabled datastores. And these errors even show in the Organization VDC’s. Yes, those system alerts can be ignored, but will also obscure real errors. When you have a small vSphere environment with Enterprise licenses and you want to run vCloud on it, the absence of storage profiles is probably the thing that will bother you most. Will Enterprise be good enough for you or will you be needing an upgrade to Enterprise Plus? 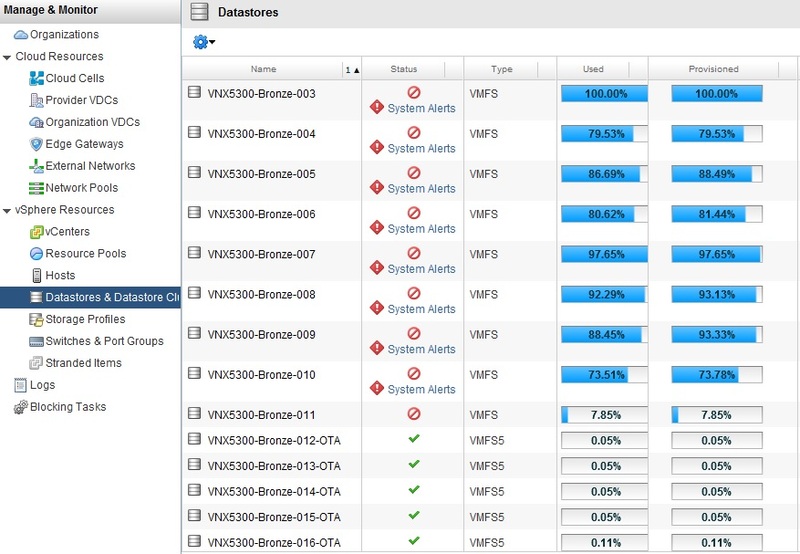 Personally I do hope that VMware will make a change in a next update and enable selecting single datastores the way this was possible in vCloud 1.5. Please, don’t forget about the small customers. When you start your vCloud project and still need to buy vSphere licenses, check the VMware site for pricing on the vCloud Suite. The vCloud Standard Suite is licensed per CPU and includes vCloud Networking and Security Standard, vCloud Connector Advanced, vCloud Director and vSphere Enterprise plus and is priced at EUR 4495,- (See: http://www.vmware.com/products/datacenter-virtualization/vcloud-suite/pricing.html ). When you need to buy new licenses for vSphere Enterprise these will cost Euro 2585,- per CPU and you need to add vCloud Director Standalone license per VM, but I can’t find online pricing for that. 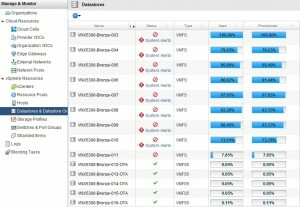 vCloud, vCloud Director datastore, enterprise, enterprise plus, storage profile, vcloud. permalink.